Blister beetles, in the Meloidae family of beetles, earned their name from their defense system. They secrete a caustic chemical, cantharidin, which is an effective repellent for predators and can cause blisters on the skin when the beetles are handled. The bodies of blister beetles are usually long and slender and often bi-colored. Their antennae are threadlike or beadlike. Blister beetles use their strong jaws to chew the flowers and foliage that they feed on. The bright red and black pattern on the blister beetle pictured above is a warning sign of their toxicity to predators. Samwa (Cleome droserifolia) is one of the most popular medicinal herbs in Egypt and a common one to come across in the wadis of South Sinai, including around Dahab. It also has one of the most beautiful blooms. Samwa is an aromatic shrub covered in glandular hairs that give off a distinct scent, one that can sometimes greet you several meters from the plant. I find its sharp fragrance quite pleasant, but not everyone agrees with me. 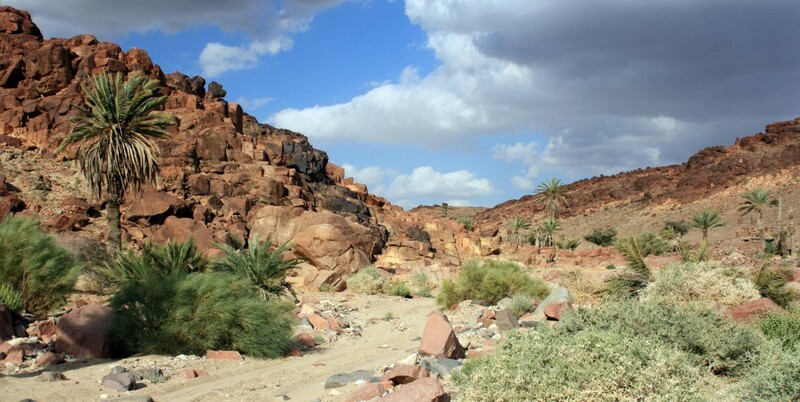 Samwa grows in rocky, gravelly, and sandy desert wadis and plains. Older bushes are round and can grow quite large, up to 60 cm high. Bedouin of South Sinai use samwa medicinally to treat a variety of ailments in both people and animals, including bee stings, internal and external infections, and diabetes. When you stop to have a closer look at samwa bushes, you’re likely to encounter Green Lynx Spiders. You can learn about samwa and more than one hundred other plants growing in South Sinai in my book Wandering through Wadis. Check it out. Crab spiders are abundant in my desert garden at home and can also be spotted out in the wadis. Belonging to the Thomisidae family of spiders, they earned their common name from the way they extend their front pairs of legs in a crab-like fashion. Female Flower Crab Spider (Thomisus citrinellus) on a flower bud of a caper bush. Flower crab spiders belong to the genus Thomisus and there are about 150 species worldwide. They earned their name from the fact that they are ambush predators, sitting and waiting motionlessly in or nearby flowers for prey to approach. Today, I will introduce you to the Flower Crab Spider Thomisus citrinellus. Female Flower Crab Spider (Thomisus citrinellus) on horsemint (habaq) flowers. Like all crab spiders, the males are much smaller and differently-colored than the females. Female spiders can vary in color – I’ve seen both yellow and white – and the color may depend or change according to the surrounding vegetation. They range from 5 – 7.3 mm in size, whereas males grow from 2.1 – 2.6 mm long. Females usually have dark spots on the points of their abdomens. The first two pairs of legs are longer and thicker and have spines. On the first pair of legs, there are four distinctive dark bristles, often seen as dots in the field. These dark bristles distinguish this from other similar Thomisus species. Female Flower Crab Spider with a male riding piggyback. Male Flower Crab Spider (Thomisus citrinellus) on a caper flower. Flower Crab Spiders prey on a variety of insects – flies, hoverflies, bees, and sometimes other spiders. Thomisus citrinellus with prey (hoverfly). Thomisus citrinellus with prey (fly). A white female, with a male riding piggyback, preying on a yellow female. Flower Crab Spiders do not build webs, but they will spin silk thread to use as a drop line or to fold leaves into a tent-like structure where they can hide in ambush. Eggs are also laid in a silk dish covered with a lid. Thomisus citrinellus with silk folding a leaf of a caper bush. Thomisus citrinellus with its silk drop line visible. In all my time in the deserts and wadis of South Sinai, I have encountered scorpions only twice. And that’s okay with me. They kind of creep me out, just like their arachnid cousins, spiders, used to. But I’ve learned to love spiders and so maybe one day I’ll feel differently about scorpions too. Indeed, I was simultaneously freaked out and fascinated when we encountered this Common Black Scorpion (Nebo hierichonticus) in a wadi last spring. Common Black Scorpions can grow up to 11 cm in length, not including the tail. Their color ranges from light or reddish brown to dark brown with their legs and large pincers being slightly lighter in color. I was relieved, once I was able to identify this scorpion, to learn that while their venom is quite toxic, causing hemorrhage and necrosis to small prey, their stings are generally harmless to humans, being compared to the sting of a honeybee. The scorpions prey mainly on big insects and spiders and sometimes on small vertebrates like geckos. Common Black Scorpions live in and under big stones and rocks or in cracks and burrows in deserts and arid mountainous regions. Sinai is home to a variety of scorpion species, including two of the most dangerous in the world – the Arabian Fat-tailed Scorpion (Androctonus crassicauda) and the Death Stalker (Leiurus quinquestriatus). You can also find Egyptian Pillar-tailed Scorpions, Egyptian Sand Scorpions, and Large-clawed Scorpions in Sinai, although this list is not exhaustive. *Aly, D. & Khalil, R. (2011). Wildlife in South Sinai. Cairo.Funded by the E.U. in cooperation with G.O.S.S. The Cone-headed Grasshoppers are very common in the wadis around Dahab, both in their black adult phase and their pale/yellow colored nymph phase. And are often seen mating, the large female carrying the smaller male on her back. The small and stocky Golden Spiny Mouse (Acomys russatus), called fa’r abu shawk dhahabi in Arabic, is named for its spiny, golden-orange colored fur that runs from its head to the base of its tail. They use this spiny fur as part of their defense system, erecting the spines to appear larger than they are to predators, which include birds of prey, owls, and snakes. They will also bite to defend themselves. Its blackish tail is shorter than its body. They have black ears with a white patch of fur behind each ear. Their underside is pale-colored, their legs gray, and their feet pale with black soles. They have a distinct white spot below their eyes. Golden Spiny Mice do not make burrows, but rather live in rock crevices and among boulders. They are more strictly found in arid and rocky areas than their cousins, the Cairo Spiny Mice (Acomys cahirinus), which are also found in Sinai. Golden Spiny Mice are also diurnal and more likely to be seen during the day than their cousins. These rodents are omnivorous and are reported to eat plant matter, seeds, dates, grains, and insects like moths and grasshoppers, but also spiders, scorpions, and dung. I spotted the Golden Spiny Mouse in the video above in Wadi G’Nai and watching him try to get all the goodies out of the caper fruit was quite entertaining! These mice can even be found at the top of Gebel Musa. Have you ever spotted one of these cute fellows in South Sinai? More of the beautiful blooms of South Sinai! This time blue-purple flowers. You can find IDs and descriptions for all of these plants – and more – in my book. I just love the common name of this moth – Crimson-speckled Flunkey is so much fun to say! This moth (Utetheisa pulchella) belongs to the Erebidae family and can be found in dry open spaces in the Afrotropical ecozone in North Africa, the Near East, and Central Asia. Their wings are white with small black spots between larger bright red one with an irregular black border. Their heads and thorax areas can be cream- to yellow-colored with the same pattern as the wings. A dead specimen, perhaps a meal for a mantis or a spider. Crimson-speckled Flunkeys fly during both the day and night, making them easier to spot than only night-flying moths. I have seen them in various locations in South Sinai, on a variety of plants. The larvae, or caterpillars, eat a range of plants. In Sinai they most likely eat the leaves of Trichodesma and Heliotropium plants, as well as others. As they eat, the caterpillars accumulate a large amount of alkaloids in their bodies, making them unpalatable and toxic to birds. Their colors serve as a warning sign: They are dark brown or gray with orange lines across each segment. They have lateral white lines along their bodies and tufts of grayish hairs. I have never seen the caterpillars, at least not that I recall, but I found the image below on Wikipedia. Have you ever spotted these moths or caterpillars on your wanderings? Wasps are insects in the order Hymenoptera, which also includes sawflies, bees, and ants. Wasps such as hornets are social and live together in a nest. But most wasps are solitary. Wasps can be predators and pollinators. Some are parasitoidal, meaning they lay their eggs IN or ON other insects. The larvae eventually kill the host insect. Solitary wasps often do this to pest insects, so can be a beneficial pest control for crops.